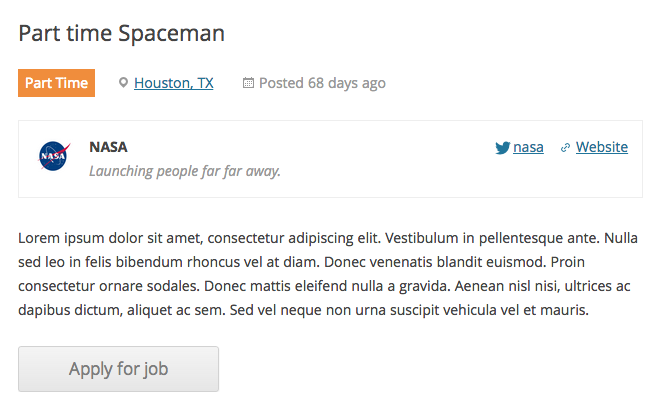 Single job listing pages use your theme’s single.php template and expand the content area to include parts like company information and the apply button. If you wish to customise the ‘application’ template you can do so with a template override. See Template overrides. If you wish to have a custom apply process, for example using a gravity form, there are some third party add-ons available. If you encounter issues with your single job listing page, or want to remove something added by your theme (for example meta/author information beneath a post) you can create a new template file in your theme named single-job_listing.php based on your single.php and edit that.